We’ve been talking about homesharing options for those seniors who aren’t quite ready for (or simply can’t afford) a retirement home but want to spend time with others in a convivial, congenial atmosphere, at a price that won’t break the bank. Recent legislation, as well as changing perceptions of homesharing, is about to give this movement a big boost. The team at GoldenHomeSharingConnections couldn’t be happier. It’s a step in the right direction toward making the golden years a bit more golden! If you missed it, the Ontario legislature just passed the first reading of a private members bill called The Golden Girls Act. It was introduced by first term Durham MPP Lindsey Park, after she heard “about a group of four seniors in Port Perry, who faced municipal roadblocks during their move to renovate and share a home.” (1) For the seniors, and supported by Ms. Park, “the benefits of shared housing are so obvious ….from reduced costs to a strengthened social network” (1) that it just made sense to “amend the planning act to specifically keep municipalities from banning this kind of shared living.” (2) Ms. Park, like others who support the initiative, says, “that kind of opposition to affordable housing solutions for seniors can’t happen again.” “Municipalities should not be trying to get in the way of seniors with innovative solutions…..Seniors living together can reap significant health, economic and social benefits and seniors are the fastest growing part of the population, both in Durham Region and provincewide.” (3) This kind of new and innovative thinking must be supported and encouraged and at GoldenHomeSharingConnections we couldn’t agree more. What this really means for seniors is that communities are embracing and recognizing the need for different kinds of living arrangements. Gone is the stereotype of an antiquated boarding house run by a widow rigid about the rules. In their place are homesharing arrangements where groups of like-minded seniors, whether friends prior to living together or not, agree to share communal spaces like the living, dining and kitchen areas of a home while maintaining private bedroom and/or bathroom suites. 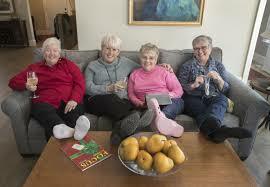 Homesharing allows seniors who own a home, but have extra space, to earn an income from sharing that home with others. It also allows those who could not otherwise afford a home to live in a comfortable, affordable housing option through renting space in a “Golden Girls” type of home. More importantly for many, it also means that they are able to remain in the community they know and love. Golden Home Sharing Connections couldn’t be happier about the changes being embraced at the municipal and now provincial level. Our focus is solely on providing support to seniors who are looking to connect with others for the purposes of finding suitable and affordable shared-space housing options. We connect people of all ages, faiths, gender and race who might be interested in sharing a home and common living expenses. Canadian senior specialist Dorothy Mazeau, a Licensed Realtor and Accredited Seniors Real Estate Specialist (SRES*) is living the golden years herself and is a vocal advocate for the community and her clients. Appearing on Zoomer Radio recently, Dorothy describes Golden Home Sharing Connections, (Golden Girls and Guys Canada) as providing an option where “you’ll be empowered to make informed decisions” about how to live out your golden years. Registering with www.goldenhomesharingconnections.ca is your first step toward a living arrangement that suits your temperament, your budget, your lifestyle and your expectations! Contact us today.